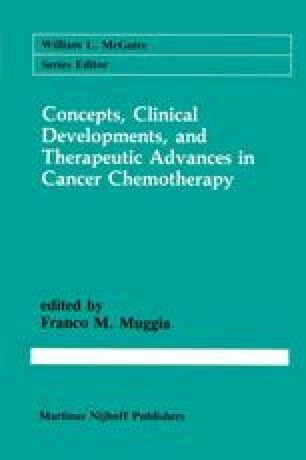 Antimetabolites have enjoyed limited success as antitumor agents. Those that are clinically useful — methotrexate, cytosine arabinoside, and 5-fluorouracil, for example, have multiple sites of action and may have several mechanisms by which they are lethal to susceptible cells. On the other hand, several antimetabolites with a single, well-defined mechanism of cytotoxicity have been evaluated in clinical trials. PALA, for example, is a potent inhibitor of aspartate transcarbamylase. Pyrazofurin inhibits orotidylate synthetase irreversibly; both arrest de novo pyrimidine biosynthesis and are cytotoxic to several tumor models in vitro and in vivo. However, in extensive phase II clinical testing by the NCI in the past ten years, neither showed any reproducible activity.